Wednesday morning we had clouds but not quite as much wind. I was hopeful for some sunbathing time. While we were away, something died in the refrigerator so before I could make breakfast, I had to clean it out. This requires lots of hot water, a little bit of eco-friendly soap and more standing on my head. 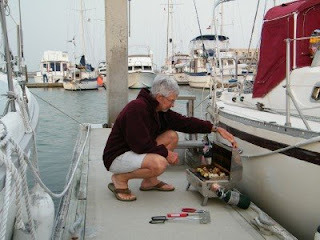 While I was doing that chore and making breakfast, Bruce got out all of the stuff to work on some much postponed boat projects. He wanted to put at least one side of the cabin table back in. 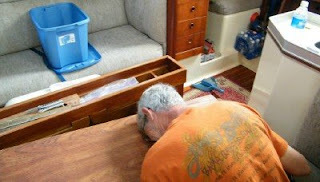 He had taken it off to sand in preparation for refinishing it. By the time he was done with the walls, he was not in the mood to do the table... so it will be done with the next go-round. As usual... I got all involved with the project and took over the fun parts. Besides... I'm much better able to get into the small places. First, I had to figure out which hinges went on which brace pieces. It wouldn't matter except that over the years, they had been bent. I got all four of these braces back in place and it was time for the table piece. See Bruce getting ready to throttle me while we discussed the best way (my way) to do this? So... 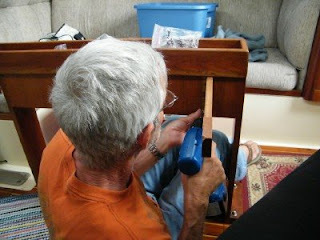 I climbed down below with the drill while he held the table piece in place. Once there were three screws in, he left me to it. There were 10 little bitty screws all tightly up against the table. Thank goodness for the cordless drill! After all of this work... I was exhausted and took a little siesta. Hey! I'm on vacation right?!? The sun came out for a while and I spent some time on the deck reading and sunbathing. Ahhh, it was nice for a while. 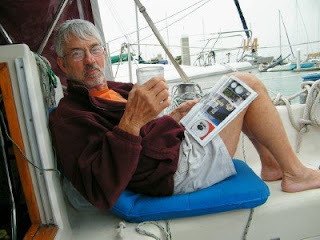 We had been planning to go back to CC to sail in the Wednesday night races and were actually in the Beater and on the road... when we got a call from Steve with a wind update. It was too windy to go out really but we could if we wanted to. Bruce opted for us to stay in Port A. So we went by the Beach Lodge for a drink and back to the boat. By this time, it began to cloud up again and I was forced to change into my warm jammies. 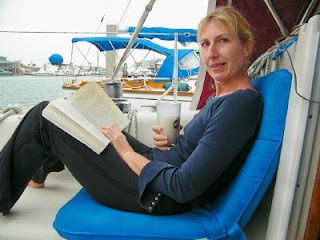 We made a pitcher of Pina Colada and read in conpanionable silence until our tummies prompted us into action again. I put together some shish-kabobs which Bruce grilled up on his not-so-new-anymore grill. It was still a bit windy so he put the grill out of the wind. 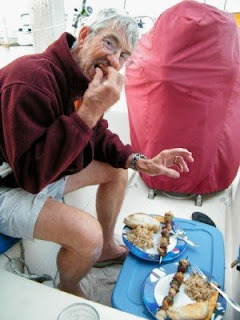 It was a delicious dinner that Bruce said he would be happy to get in an expensive restaurant. He sure takes the husbandly code seriously! It was a good day and ended with the sunset.